Pictures of broken shards probably don’t count. Even though quite often more of the ‘big picture’ can be learned about a type, technique or trajectory of development than by looking at just the whole thing. So what about plain unglazed cylinders? No bottoms, no tops, just plain, straight sided cylinders. Pretty boring stuff. But taking a step back to look at the bigger picture can be instructive. And hopefully, not always boring. 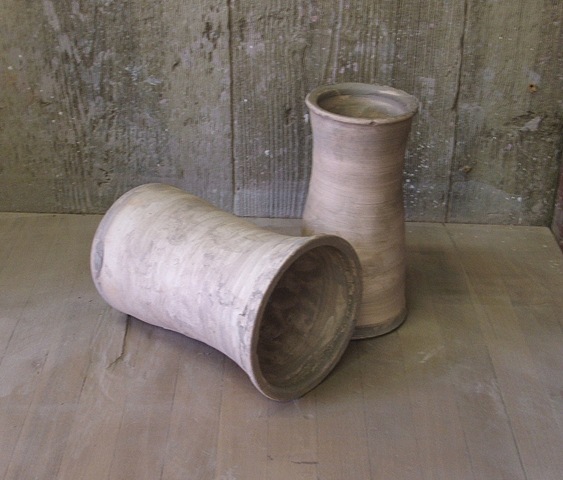 Some Redware potters, like Hervey Brooks of Goshen CT, kept various sized cylinders about the shop. On hearing of these, my fist thought was trimming chucks. But Hervey didn’t trim his pots. One day it hit me – put a cylinder on a table, fill with a material and scoot into a bucket or quern (grinding stone basin). Seven times for lead, once for “loam,” (clay). Maybe add a little copper or manganese for extra color (or maybe pigs blood, but that’s another story). An ingenious way to measure out glaze materials. Ps. For those who need pictures, here’s a couple cylinders I keep around my shop. But these actually are trimming chucks. 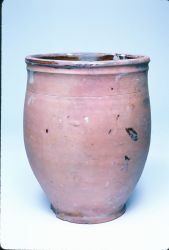 Lead Glazed Pottery. Edward Atlee Barber. Museum of Philadelphia/Philadelphia. 1907. George Brooks was one of the signers of a 1783 petition to John Hancock seeking to establish a settlement at Orrington, ME (then still part of Massachusetts). He set up a pottery shop there and built the town’s first wind-powered gristmill before 1800. One of his sons, John Brooks, moved to Cincinnati Ohio shortly thereafter and claimed to have built the first steam powered boat on the Ohio River. Harrison Nash Brooks began working in great grandpa George’s pottery when he was 7. He would guide the horse that powered the clay sweep, grinding a batch of clay in about an hour. He was paid a penny for each batch. Harrison eventually took over the shop. By 1873 the shop employed 5 men. They dug their clay from a nearby riverbank. The shop operated about 10 months out of the year, and annually turned out about $3,500 worth of ware, a small to middling enterprise. Harrison was never himself a professional potter, but he did like puttering about in the shop. Some time around the turn of the century he retired and moved to Brewer, ME. There he set up a little pottery in his garage, where he made a few things and sort of offered pottery classes to friends. Harrison wasn’t very good with glazes and the several kilns he built over the years never worked very well. His last project was a huge, newfangled “electric kiln,” costing him over $3,000. His wife and friends implored him to dismantle the beast before he electrocuted himself. He finally did without ever having used it. The pottery he personally made tended to be rather heavy. His glazes were equally thick and problematic. His one success was his “Laminated Glaze,” a sort of tiger-striped glaze he made up from scratch. It seems the only thing that really mattered to Harrison Nash Brooks was just being able to play with clay. Well, that’s good enough for me. You are currently browsing the archives for the traditional ceramics category.